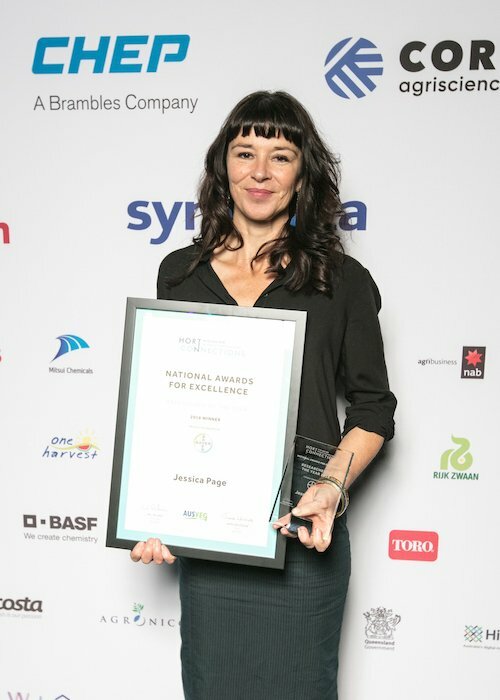 Jessica Page has received the prestigious ‘Researcher of the Year’ award at the Hort Connections National Awards for Excellence. She was presented with the award in front of an audience of over 1,500 people at the Hort Connections Conference dinner in Brisbane on 20 June 2018. Jessica received the award in recognition of her more than 22 years of successful research and extension work that has contributed to the vegetable industries in Australia. This includes working directly with vegetable growers to help them implement IPM and a range of research projects to help entire industries to understand and adopt IPM. Her research has included testing pesticides for their effects on beneficial insects and mites, and she is currently leading a project doing exactly this for the Australian vegetable industry. 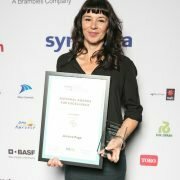 She won the “Researcher of the Year” award in this year’s Victorian AUSVEG awards which put her in the running for the national horticulture Awards for Excellence. Jessica comments that “I don’t do research just for the sake of it. I want the results of my work to be used by farmers and advisors and this award is a great recognition that I am achieving that aim. Also, I am aware that over the years we have learned as much from growers as they have learned from us, and I really value this collaborative approach to research”. Angelica Cameron from IPM Technologies was also nominated for the same award and received the award of “Researcher of the Year” in South Australia which is a resounding endorsement that our small company is achieving great results for the vegetable industry in Australia. Paul Horne won the national “Researcher of the Year” award in 2009 and so the company is continuing to deliver outcomes appreciated by industry.